It’s easy to forget that winter isn’t forever, especially when all you see is snow. Well. it’s almost over! Soon, it will be time to make a outdoor branding push. It’s important to remember that although the weather is getting warmer, it does not mean it’s getting nicer. Mother Nature has always had a “love-hate relationship” with the event industry. Creating successful, safe outdoor experiential marketing programs require upfront thinking, and the right execution so the elements never become a problem. Trends show that event agencies are devoting more focus on leveraging exhibit displays that can withstand wind, rain, and snow. Just a little bit of planning and careful selection of event properties can go a long way toward making everything run smoothly. The number one element to take into consideration when creating outdoor event environments is wind. After all, if branded flags get wet in a rainstorm, they can easily be dried. But if one catches a 30-mile-per-hour gust and goes flying off, that presents a larger set of problems. Winning the battle against wind comes down to the concept of least resistance and anchoring. It’s critical to seek out event displays that have the least resistance to wind, feature broad bases, and sheer weight when you know a campaign is going to be outside. When it comes to signage, heavy base plates will keep them in place, but remember to budget time and money for those plate to be transported, stored and installed a every event. Most displays feature empty tanks built into the bases that are filled with water onsite to weigh down the event exhibit (Keep in mind the event staff will need access to a hose or water supply). You want to ensure that the graphics and exhibits partners you select are aware of the intended uses of the event platform so that they can leverage the appropriate printing technique, materials, and inks used. Some fabrics retain water more than others, which could make a display heavy and cause it to sag in the rain. The Expand experts suggest that for outdoor usage, agencies should lean towards light polyester, sheer fabric or vinyl-materials that are not going to retain water and add weight to the display in the event of a storm or problem. 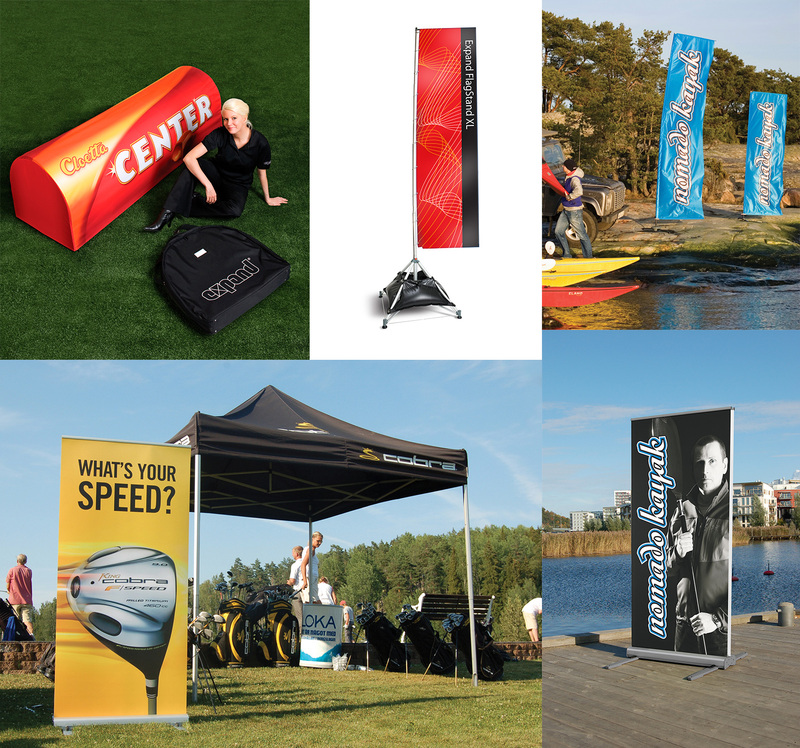 All in all, smart graphics and exhibit design is key when creating signage for outdoor events. Viewing distance is key for big outdoor events, so try to visualize the event through the attendee’s eyes. Make sure the images in your graphics can be seen from a distance and that your text is large enough, so your message doesn’t get lost in the crowd. Check out out all the Expand Outdoor Event Environments to find the best way to invigorate your outdoor messaging.